The Tiger Moth is a true aviation legend. Having entered service in the early 1930s, this well-loved biplane remained the RAF’s primary trainer until 1952. Many aircraft have been preserved and still fly today. 1. This D.H.82A(T-8209) is preserved at the Polish Aviation Museum at Cracow, Poland. It carries its wartime colours of No 25 (Polish) Elementary Flying School at Hucknall, 1943. 2. This Tiger Moth was built in 1939 (c/n 82292) and served with the RAF before being “demobilized” and transferred to the civilian registry as G-AGHY. 3. G-AHIZ (ex RAF PG-264) is a good example of a modernized Tiger Moth, and is still being used as an initial trainer. It has been fitted with updated radio equipment, an electrical generator (fitted between the wheels) and a rear-view mirror. It is owned and flown by the Cambridge Flying Group. 4. G-APAP is still flying today under the RAF colours of R-5136. 5. G-AZZZ is another privately-owned Tiger Moth, that was brought back from France, and then restored to flying condition in Great-Britain. 6. The Imperial Iranian Air Force used the Tiger Moth and even produced some at the Shahbaz factory. 7. PG-712 was one of the RAF aircraft transferred to the RNLAF postwar. 8. Another Dutch aircraft, this one was modified with the infamous “Fokker tail” imposed by Dutch aviation authorities. 9. 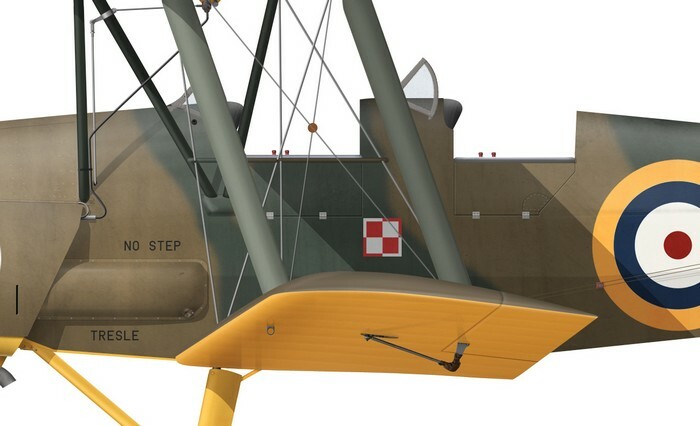 Belgium was also one of the operators of the Tiger Moth. The rear seat has a foldable hood for blind flight training.